USA is eliminated from the Fed Cup World Group for the first time since 1995! Andrea Petkovic’s defeat of America’s Melanie Oudin has ensured Germany will regain its place in the World Group for 2012. This result means USA has dropped out of the World Group for the first time since its formation in 1995. This was Petkovic’s second singles victory of the weekend after she saw off the youthful challenge of Christina McHale 63 64 on Saturday. She has now extended her current Fed Cup singles winning streak to six matches, having won both singles in Germany’s 4-1 World Group II victory over Slovenia in February. Petkovic plays in Stuttgart on a career-high ranking of No. 19 having reached the semifinals in Miami last month. Oudin, whose stellar Fed Cup performances for the USA have seen them reach the final for the last two years, has struggled for form of late and also went down 62 76(5) to Julia Goerges yesterday. The American was unable to capitalise on a 4-2 lead in the second set. Sands & Oudin struggle into round two. Bethanie Mattek-Sands defeated Vera Dushevina in the opening round of the BNP Paribas Open at Indian Wells. Mattek-Sands called for the trainer while leading 6-4 4-3 and after a lengthy delay, including a visit from the WTA doctor, went on to beat the Russian 6-4 6-4 and set up a second round clash with 10th seed Shahar Peer. Elsewhere, Lucie Safarova, Alla Kudryavtseva, Anastasija Sevastova, Timea Bacsinszky, Sara Errani and qualifier Alize Cornet all advanced, while there were also wins for Kimiko Date-Krumm, Barbora Zahlavova Strycova, Alla Kudryavtseva, Sybille Bammer, Monica Niculescu, Coco Vandeweghe, Sania Mirza and Melanie Oudin. American wild cards Vania King and Lauren Davis bowed out to Gisela Dulko and Zuzana Ondraskova respectively. USA’s young ‘guns’ are hoping that the indoor hard court venue will be enough to give them a victory. Italy will be hoping for a repeat result of the last year’s Final when it travels to San Diego in November as the defending Fed Cup by BNP Paribas champion. USA and Italy are meeting for the second successive year to decide the destination of the trophy, and the visitors will draw strength from the 4-0 victory on clay in Reggio Calabria in 2009. That was Italy’s only ever win against the Americans, with the head-to-head score now standing at 9-1. USA has home advantage this time and has selected to host the tie on an indoor hard court. History may lean towards the Americans, but recent form makes the Italians favourite. USA has battled past France and Russia in this year’s campaign, while Italy has lost just one rubber on its way to victories over Ukraine and Czech Republic. Similar to last year, both nations have experienced contrasting routes to the Final. USA has been forced to dig deep, while Italy has cruised through with the loss of just a single rubber. USA’s first round tie against France was actually a routine affair, as Melanie Oudin and Bethanie Mattek-Sands doubled up to give the away team an unassailable 3-0 lead in Lievin. Mattek-Sands and doubles specialist Liezel Huber successfully teamed up in the fifth rubber to leave the scoreline 4-1 in favour of the visitors. The French team was a far cry from the one that lifted the trophy in 2003, but it was still a positive performance from an American side that possessed a healthy mix of youth and experience. The reward for USA was a home tie in the semifinals against old foe Russia. The Russians had won the last three meetings between the two powerful Fed Cup nations, but revenge was around the corner for Fernandez’s team. Such is the strength in depth at the disposal of Shamil Tarpischev, Russia’s captain, he consistently has the luxury of naming his team from a pool of over a dozen Top 100 players. Mattek-Sands & McHale reach the semis in Quebec. Third seed Lucie Safarova came back from 3-0 down in the final set against Melanie Oudin to move into the semi-finals of the WTA Tour Bell Challenge in Quebec. Oudin, seeded fifth, raced into a 3-0 lead in the deciding set before her Czech opponent reeled off five straight games in a gruelling contest. Oudin, of the United States, took the first set 6-4 before Safarova levelled with a dominant 6-2 second set. Oudin appeared to be easing to victory but Safarova dug deep to triumph in two hours and 20 minutes. There was little to choose between the two, Safarova, the world number 28, producing five aces as well as seven double faults. Eighth seed Sofia Arvidsson crashed out as qualifier Tamira Paszek moved into the semi-finals in Canada. The Austrian, who is ranked 103 places beneath her opponent at 151, was more consistent with her all-round game and capitalised on Arvidsson’s lack of success on her second serve. Paszek wrapped up a 6-3 6-4 victory in one hour 36 minutes. Bethanie Mattek-Sands had a straight-sets victory over Rebecca Marino although the world number 71 did not have it her own way as she claimed a 6-4 7-6 (7/4) victory. Mattek-Sands was more clinical on her own serve and won a close-fought game in one hour 37 minutes. Eighteen-year-old Christina McHale eased into the last four with a 6-3 6-1 win over Alexa Glatch. McHale produced five aces and dominated throughout. Canadian wildcard entrant stuns top seed Bartoli. Marion Bartoli made a shock second-round exit from the WTA Tour Bell Challenge when she was stunned by wild card Rebecca Marino in straight sets in Quebec. The 2007 Wimbledon finalist is ranked 139 places above her Canadian opponent but that counted for nothing as Marino claimed a 6-3 6-1 victory. Bartoli’s game deserted her as she produced eight double faults to Marino’s one with the teenager also firing down 10 aces. The Frenchwoman failed to convert any of her three break points and victory was wrapped up in an hour and 15 minutes. With second seed Aravane Rezai knocked out the previous day, it means Lucie Safarova is the highest-ranked seed remaining. The world number 28, seeded third in Canada, was superior all round as she progressed with a 6-4 6-2 win over Johanna Larsson. Larsson had eight opportunities to break her opponent but converted just one and Safarova enjoyed a straightforward victory in one hour 25 minutes. Fifth seed Melanie Oudin eased through 6-3 6-0 against Anna Tatishvilli but sixth seed Julia Goerges crashed out in straight sets, beaten by American Bethanie Mattek-Sands. Mattek-Sands produced four double faults but she was vastly more clinical with her service game and ran out a 6-1 6-4 winner. Oudin bows out, but McHale wins in the heat. Fifteenth-seeded Nadia Petrova became the third seeded player to be eliminated from the $2 million Cincinnati Women’s Open when mid-90 degree heat forced her to retire from her match while trailing against Christina McHale on Tuesday. McHale won the first set 7-6 (4) and was leading 5-3 in the second when the 21st-ranked Petrova retired because of heat illness. She became the second player to retire because of the heat. Olga Govortsova retired against 13th-seeded Shahar Peer on Monday. In other matches, 16th-seeded Marion Bartoli beat Alona Bondarenko 7-6 (4), 6-1 to reach the third round. Twelfth-seeded Yanina Wickmayer advanced to the second round with a 6-2, 6-2 win over Greta Arn, Sybille Bammer beat Sorana Cirstea 7-6 (5), 6-2, Elena Vesnina eliminated Melanie Oudin, 6-2, 6-3. and Anastasia Pavlyuchenkova ousted Daniela Hantuchova 6-3, 6-1. Bartoli and Oudin first round losers in Warsaw. Marion Bartoli was the major casualty on the second day of the Warsaw Open. 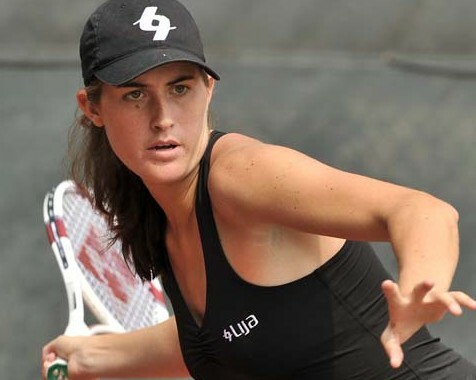 The fourth-seeded Frenchwoman succumbed to a first-round defeat at the hands of Klara Zakopalova of the Czech Republic. Bartoli made a strong start under grey skies in the Polish capital but her unseeded opponent fought back to seal a 4-6 6-1 6-2 triumph. Eighth-seeded Melanie Oudin of the United States also slumped to an early exit as she was swept aside 6-0 6-2 by Slovakia’s Magdalena Rybarikova. Seeded Chinese duo Li Na and Zheng Jie both avoided upsets as they moved into the second round. Third seed Li thumped Ioana Raluca Olaru of Romania 7-6 (7/4) 6-0 while Zheng, the fifth seed, had a harder time of it as she ousted Olga Govortsova of Belarus 6-1 5-7 7-5. Sara Errani, Timea Bacsinszky, Polona Hercog, Tathiana Garbin, Greta Arn, Barbora Zahlavova Strycova, Tsvetana Pironkova and Katarzyna Piter also progressed to the second round after wins today. Top seed Caroline Wozniacki of Denmark and Russian second-seeded Elena Dementieva are in action tomorrow after receiving first-round byes. Oudin in a ‘must win’ situation today! Melanie Oudin begins USA’s quest to reach a second successive Final, as she faces Alla Kudryavtseva in the opening rubber of the Fed Cup by BNP Paribas semifinal in Birmingham, Alabama. Oudin, who adopts the role as American No. 1 in the absence of the Williams sisters, is ranked nearly 50 places higher than her Russian opponent. Despite this gap in the world standings, however, the only previous meeting between the two players – coming earlier this year at the Australian Open – ended in a three-set victory for Kudryavtseva. Dementieva is carrying the weak Russian team on her back, and must win both her singles matches for Russia to have any chance at all. The US has the best doubles team, and needs 2 singles victories to reach the final. The second rubber sees Bethanie Mattek-Sands take on Elena Dementieva, the world No. 6, in a real ‘David v Goliath’ clash. Mattek-Sands will take confidence from her win over Alize Cornet of France in February’s first round, but playing Dementieva will bring about a completely different challenge.